K-Town locals with young kids make a bee-line for their state-of-the-art, heated public swimming pool, as it caters brilliantly for young families. It has great swimming areas for the kids, a family changing room and even a jacuzzi! Architecture buffs will appreciate the sleek, futuristic design of the complex, with part of the roof designed so that swimmers have views over the water. This swimming pool is tucked away in a little pocket between Happy Valley, Causeway Bay and Wan Chai and is a good option for a quieter swim as it doesn’t have the bells and whistles of some of the other public facilities. There is an indoor and outdoor pool, with a toddlers’ pool outside. It has a snack bar and lounge chairs. 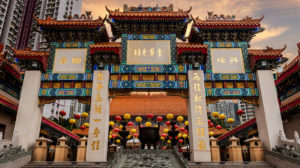 Victoria Park is a much-loved recreational hub for Hongkongers, and its swimming pool is designed to cater for the throngs of families which flock to the park. The complex has five pools, including a deep-water diving pool, a shallow children’s pool and a paddling pool. There’s also a good-sized area with sun loungers to relax and a family changing room. 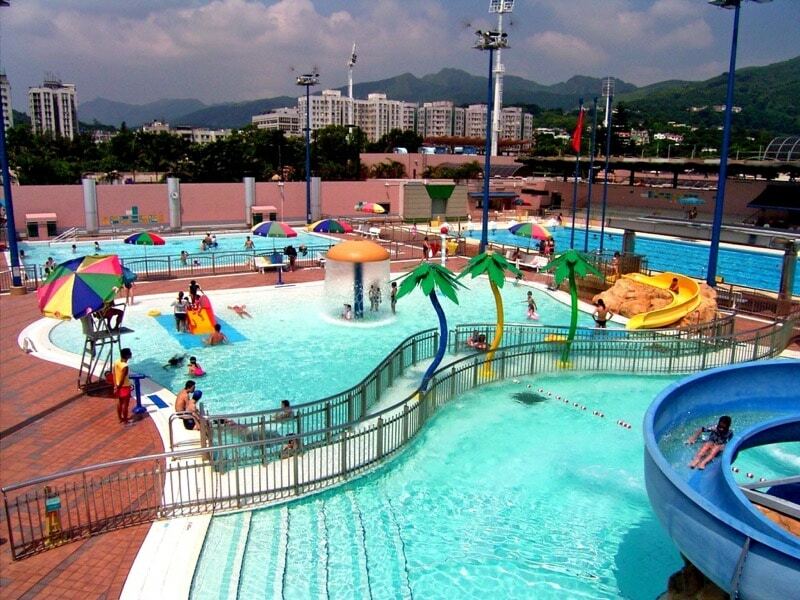 As Wong Chuk Hang becomes increasingly popular, more and more people are cottoning on to this huge public swimming pool complex which is absolutely huge! There are two main pools, two teaching pools, a training pool, a diving pool, a toddler pool and another pool ideal for older kids. The kids’ pools have a variety of slides and other water play features. It also has sun loungers and a family changing room. When the little ones tire of looking at the flamingos and exploring the various play areas in the park, take them for a swim in the park’s swimming pool complex. Spread across two levels, there are three outdoor leisure pools of irregular shapes linked together by waterfalls, a footbridge, one circular paddling pool and a sun bathing area. There is also a sun lounger area and four indoor heated pools. This is one of the more legendary of the city’s public swimming pools as the indoor pool area has a pirate ship with water cannons on it! The outdoor facilities are equally as appealing to kids, with a sprawling selection of spaces including a toddler pool, a number of water slides and a fountain. A good choice if you have younger children as this swimming pool complex has a number of features well-suited to the smaller swimmer. Its has four leisure pool areas, with slides, water guns and other water play equipment. It also has a family change room. This public swimming pool has a lovely leisure pool area with a fountain and water slides suitable for varying ages, which will keep the kids happy. Meanwhile, mum and dad can enjoy a few laps in the main pool area and enjoy the spectacular Sai Kung views! This pool is well-known by water slide fans, as it has a good selection suitable to older children. It also has a toddlers’ pool and a family changing room. The public swimming pools are closed for cleaning on different days of the week, as well as being closed periodically for annual maintenance and repairs. Check the individual schedules on the Leisure and Cultural Services Department website for details. 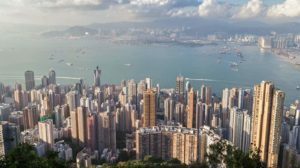 Want to stay in the loop with what’s happening in Hong Kong? Follow the Expat Living Facebook page. Head to our Things to Do section for more ideas!